November 2015 -- As the clocks rolled backward, Dixie Region moved forward in anticipation for a day filled with fun, excitement, and suspense. An accelerated schedule meant an even earlier start for competitors. Event Staff Crew led by Rookie Event Chair Aaron Kemmer arrived on-site in preparation for an action packed-day. Despite the ominous clouds that surrounded the site and scattered rain that dampened the course, preparations continued. Thirty-four (34) Entrants took to the course during morning runs with five attempts each to try and win the class. At the end of Competitive Runs, almost 200 successful timed runs were recorded. These runs would encompass the Dixie Points Event for the day. Breaking for lunch, a sudden downpour fell upon the Course as both racers and corner workers ran for cover to try and gain some respite from the weather. As the break drew to an end, the skies around Spence Field began to clear and three Shootout Brackets were seeded. 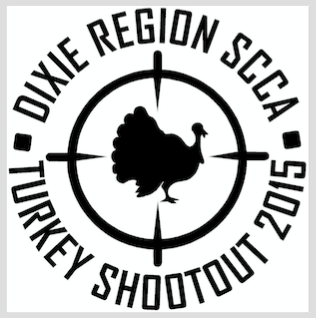 Twenty-four (24) total competitors were invited to compete in the Turkey Shootout Bonus, Club, and Super Brackets. The Top 8 PAX Competitors were invited to participate in the Super Shootout, followed by 9-16 in the Club Shootout, and 17-20 plus 4 random draws in the Bonus Shootout. All three brackets offered some tight racing and close calls. Winning the Bonus Shootout by a margin of 0.235 seconds (after also having previously won the Novice Class earlier in the morning) was Ernesto Boasque in his G-Street #11 Volkswagen GTI. The Club Shootout was determined by an even narrower margin of 0.172 seconds and won by Brantley Herman who was competing in only his second Autocross Event EVER in the borrowed STR #38 Honda S2000 owned by Nathan Gordon. The Super Shootout got underway and the top guns battled it out. Some fast and exciting racing came to an exciting finale pitting Brian Meyers in the F-Street #85 Ford Mustang GT against Mark Canekeratne in the D-Street Prepared #22 BMW 330ci. Tensions rose and murmurs from the crowd grew as a prelude to the upcoming Dixie Allies vs. Axis Solo Event next month pitted an Allied car against that of an Axis Power. Mark drove through the lights with a blazing time of 35.333 as Brian began his assault on the course for the deciding run of the Super Shootout. Brian ended the run with tire smoke and screeching as his Mustang spun through the finish with a scratch time of 35.878 plus four cones, allowing Mark to claim victory in the Super Shootout. September 2015 - Click here for a debrief of Dixie's representation at Nationals. Co-authored by JD Kemp and Robert Ippolito. June 2015 – Dixie Region will host a Match Tour at Spence Field, Moultrie, GA on June 5 – 7, 2015. 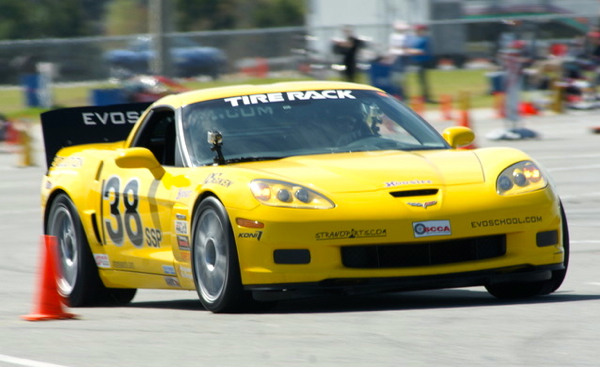 Match Tours are the latest addition to the Tire Rack SCCA National Solo Series. These events are three events in one package. The event is broken into four sessions. Session 1 and 2 are on Saturday. Each consist of a traditional 3 run autocross. the best run from each session will be added together to determine class rankings (basically a mini Champ Tour). Session 3 is another three runs to determine the qualifiers for the Super and Club Shootouts. The top 8 on index per heat qualify for the Super and 9-16 on index per heat qualify for the Club Shootout. Everyone else is eligible for the drawing to be in the Bonus Shootout. Session 4 is the Shootouts. May 2015 - Shifting gears and turning our attention to Moultrie, Georgia, the Dixie Region SCCA would like to welcome you back to Spence Field located in Moultrie, GA! Due to a cancellation of our original Solo Event #3, we are holding an event on Sunday, May 3rd as a make-up date! We hope you can join us and hope to see you at at Spence Field on May 3rd! 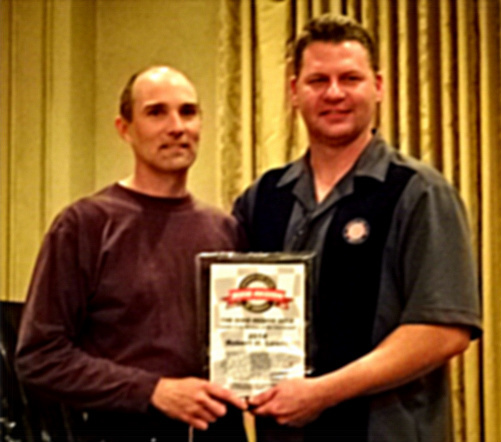 January 2015 - Class Champions for the 2014 Dixie Solo season were announced at the January 12th awards banquet. 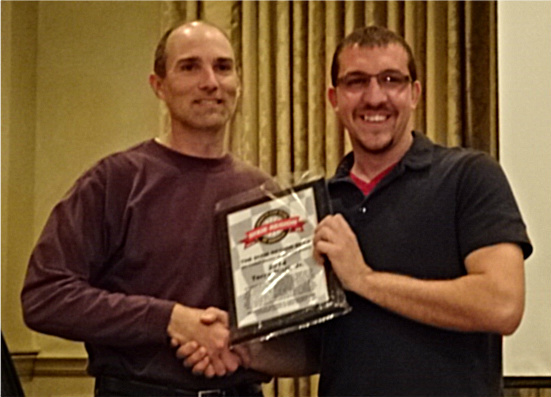 Top honor of 2014 Driver of the Year goes to Jamie Bell (pictured at right wirh Bryan Batchelor) for winning the most points during the 2014 season in the ESP Class. The Member of the Year was awarded to Robert Lewis (pictured at left with Steve Seymore) for his dedication and tremendous volunteer work for the club. 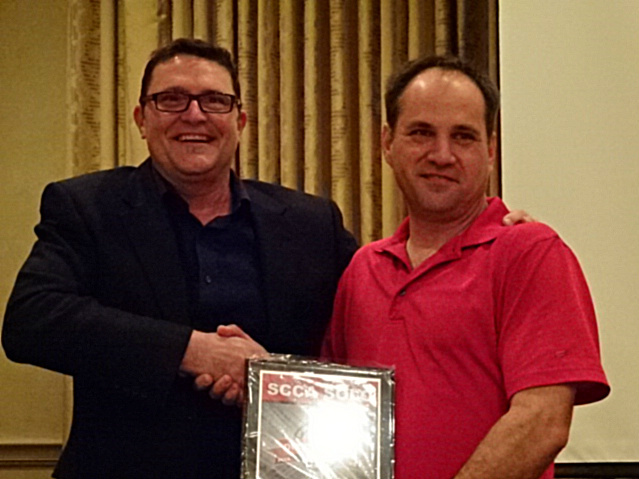 The Worker of the Year went to Terry Nitti, Jr. (pictured at right with Steve Seymore, RE) for his extraordinary contributions to Dixie Region. There were several gag awards handed out as well. Many thanks to Steve Seymore for coordinating the annual banquet, and to his wife, Deborah, for the room arrangements at Sittig Hall. 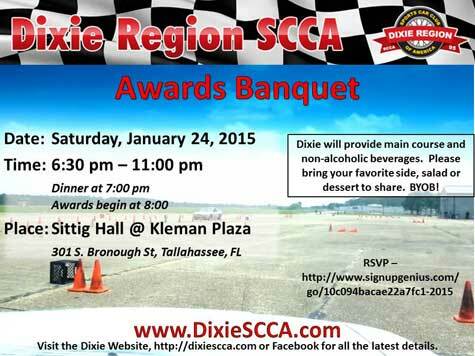 January 2015 - With another great year behind us, it's time again for the annual Dixie Region Awards. Come join in the celebration of all things Dixie with food, drink, racing and awards presentations. Non-Members welcome. The region will provide main course and non-alcoholic beverages. Please bring your favorite side, salad or dessert to share. BYOB! RSVP online.